Around 20 years ago, the “Indian Express” had a special publication called “Web Vision”. 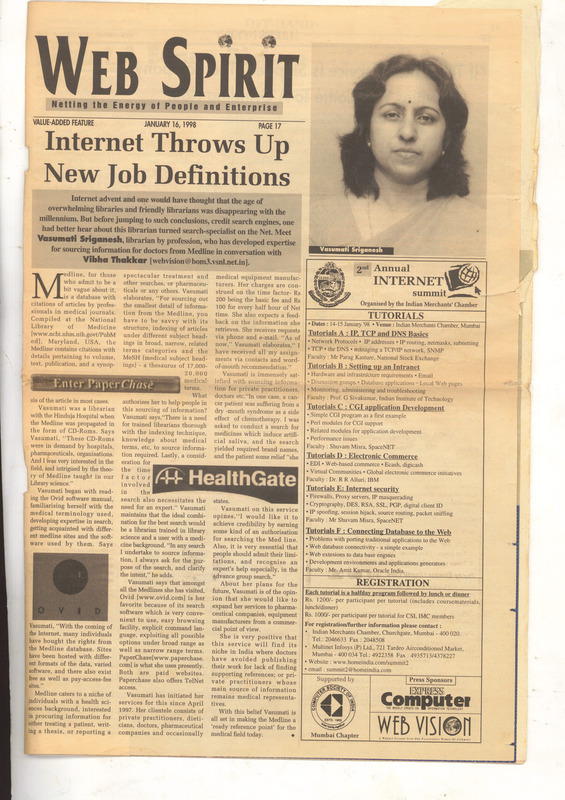 In the January 1998 issue, they had featured me in a column called “Web Spirit”, in an article – “Internet throws up new job definitions“. I had a copy of this issue, but it had at some time got misplaced in office. In our quest to find something else, it unexpectedly surfaced. I read the article again and I share my observations and feelings. The article described how as an independent consultant (that was what I was then), I helped doctors and companies search Medline. One part of the article caught my eye. It set me thinking. Twenty years later, some of this has changed. Lots more health professionals (and even health sciences students) are publishing now. The main source of information (I assume) is no longer the medical reps of the industry as most medicos are Internet users. 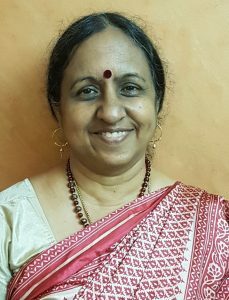 But, what I have observed through all my teaching and mentoring and through my interactions at workshops and more, is that the “lack of supporting references” is still a problem for health professionals. Some may argue that the problem today is not the lack of literature but the overload. Of course that is true. But the deluge brings the same problem – not being able to find the most relevant / useful literature. People most often “make do” with something reasonably good in the first 2-3 results pages! And if/when they do find relevant / useful literature, they have another problem – they get only abstracts and not the full article. So let me get to my question – Are health professionals today – “information savvy”? My answer is that in large numbers, many of them are. But as a percentage of all health professionals in the country, it is only a small percentage. Information savviness has to reach a huge denominator! My observation: I often hear the phrase – “I found this in google” and not “through a google search”, or people writing – “Source: Google”. A first indication of information illiteracy! My observation: Again, people search and pick up just about anything that a search engine retrieves, without checking what the source is! I have just listed a handful of basic facts about being information savvy. What are the prices we pay for the lack of information savviness? In India, we have “national access” to “The Cochrane Library”. This resource has six databases and the first – Cochrane Database of Systematic Reviews helps in finding out evidence about several topics. Evidence that helps doctors in making treatment and diagnostic decisions. Anyone residing inside the Indian borders has full text access to every Cochrane Review and to abstracts of all five other databases thanks to the Government (specifically the National Medical Library) paying for a country-wide license. But – the percentage of health sciences professionals and students who know and use this resource effectively is low. The numbers have been rising over the years, but the percentage is still very low. The country is paying a price of not reaching out to all the target audience by promoting awareness and training in the use of this resource! There are several ways in which libraries can improve the access they provide to their users. Again – while there are some excellent libraries in the country that do, there is a much larger denominator that does not. And all this – because the focus is so much more on the T of the IT and not on the I of the IT! Today many students, practitioners and professionals of health sciences confuse tech savviness with information savviness. Thankfully there are a few who realize the difference. But overall, in this area, not much has changed since 1998. The domain of “Information Sciences” is a specialty and it is not easy to learn information handling just with short sessions. Information literacy and more has to be a part of learning – on a continuous basis. If you have read through this blog post and are willing to create a “QMed group” in your institution, through which we could have discussions to take things ahead, do write to info@qmed.ngo – Let us make a start! ← Finding Our Way Through Shades of Gray: 6 Virtues to Guide Researchers in Planning, Conducting, and Writing Up Research.